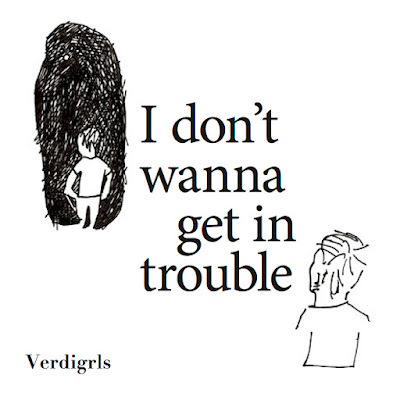 The Le Sigh: Premiere: Verdigrls - "I Don't Wanna Get in Trouble"
Premiere: Verdigrls - "I Don't Wanna Get in Trouble"
Tune in to the new Verdigrls single. If you haven’t heard of Verdigrls, rest assured that you will soon enough. Their debut track, titled “I Don’t Wanna Get in Trouble,” proves to be brilliantly refreshing, imbued with honesty and delicately crafted lyrics. In their previous releases, Brooklyn trio Verdigrls have ruminated on the various degrees of relationships through a lo-fi indie pop lens. The stories of losing and missing someone are poignant and poetic, bringing alive the trance-like states we often find ourselves in when lost, be it in a dream or elsewhere. Their new single is similarly gripping, as the dissonant guitars create a haunting and dreamy soundscape. Balancing beauty and darkness, their sound is both immediate and gradual, layering dreamy synths that could land them a gig at Twin Peaks' Roadhouse. The track is gentle and soothing, building from electro-acoustic whispers to a landscape of glistening, subliminal bliss. Sisters Anna and Catherine Wolk's vocal harmonies soar as they reflect on needing a new space to grow; “My mind is clear get me out of here / I wanna get away to a bedroom in the city.” Verdigrls captures the struggles of getting back on your feet and feeling like yourself again after moving to a foreign space and starting new. Hummable hooks and a poppy rhythm section underline what is otherwise a wholeheartedly hefty song, lyrically and vocally. Disorienting and infinite repetitions ensue, lulling you blissfully into an echo chamber that you won’t want to leave. "The bones of the song were written by Catherine when she moved home after leaving college to a home life in transition. After a few years we dug it out of the the archives, because it resonated with every member, moving home after leaving college after being a good kid and overachiever. This paired with the optimism in the guitar and major melody, the song is the light in the dark, and commemorating a time when we wanted what we didn't have." Listen to Verdigrls on bandcamp.